All our breeding cats are tested and free of genetic diseases (PRA, PKD), all cats in the cattery are free of FeLV (feline leukemia) and FIV (feline AIDS). Our Rex Cornish kittens are covered by a two-year written health guarantee and are already sterilized (spayed or neutered), dewormed and vaccinated before leaving for their new homes. Our cats are characterized by their highly sought-after type, true to the standard of the breed; flowing curves, defined lines, large well placed ears, large eyes reflecting their keen intelligence, silky coats, graceful bodies, long and athletic, their quality will meet your expectations. Curiosity, intelligence, affection and social attraction make them companion cats of exceptional quality! We have a very limited number of Cornish Rex kittens for sale, so it's a good idea to reserve well in advance. Our kittens are socialized in our home with our children, cats and dogs, in a healthy and loving environment. Cats and their kittens receive stimulating interaction every day! We are passionate about this very special breed and our mission is to produce healthy kittens, aiming for the longevity and unique temperament of real Cornish Rex cats. Our cattery is located in Granby, about an hour from Montreal or Sherbrooke, Quebec, Canada. ** We have a new male in the house! 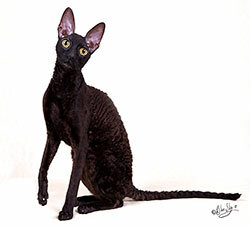 Come meet Arabesque in the Our Cornish Rex Cats page.